Center a rack in the oven and preheat to 350 degrees F. Generously butter and flour a 9- to 10-inch (12 cup) Bundt pan. (If you use a silicone Bundt pan there’s no need to butter it.) Do not place the pan on a baking sheet – you want the oven’s heat to circulate through the Bundt’s inner tube. Working with a stand mixer, preferably fitted with a paddle attachment, or with a hand mixer in a large bowl, beat the oil and the sugar together until well blended. Beat in the vanilla, then add the eggs one at a time, beating for about 1 minute after each egg goes in. Reduce the mixer speed to low and mix in the bananas. Finally, mix in half the dry ingredients (don’t worry when the batter curdles), all the sour cream and then the rest of the flour mixture. Scrape the batter into the pan, rap the pan on the counter to debubble the batter and smooth the top. 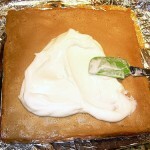 Bake for 65 to 75 minutes, or until a thin knife inserted deep into the center of the cake comes out clean. Check the cake after about 30 minutes – if it is browning too quickly, cover it loosely with a foil tent. Transfer the cake to a rack and cool for 10 minutes before unmolding onto the rack to cool to room temperature. If you’ve got the time, wrap the cooled cake in plastic and allow it to sit on the counter overnight before serving – it’s better the next day. I added chopped up snickers to my brownie batter. Great job on the TWD goodies! I really loved this recipe. Your bundt cake looks beautiful. I’m glad it was a hit. Yeah, the brownies. I don’t know what to say about these. I like the addition of nuts and I really wanted to like them. Oh, well. At least they look yummy. oh yesh.. that reminds me of how delicious the bundt cake was. haha. I want a slice! 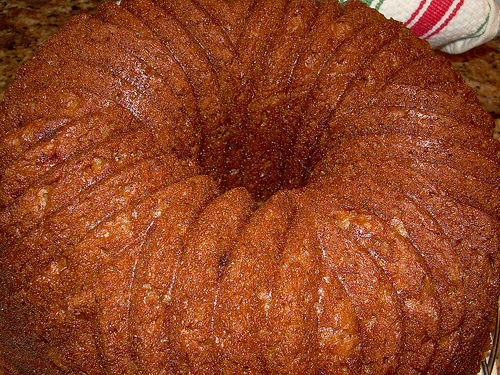 Too bad your brownies weren’t a favorite, but you definitely made up for it with the delicious banana bundt cake! Felt the same way about the topping. But your bars look amazing. Next time I will put nuts and just use it for a cheesecake base. And your bundt cake is beautiful. LOve the pattern. I like the bundt cake design too. Where did you get that pan? I missed the banana cake. Before I joined the group. You have almost convinced me to go back and try it. Wow! Both of these look great. And I LOVE your bundt pan…so pretty!! Thanks for going back and making the Bundt. Looks great and I’m glad you liked it!!! Thanks so much for the tip about the pan. I’m putting that on my list. I love the walnut idea. I love nuts in my brownies, too.. so that will be a playing around next time I make them! Well, I’m glad you had a big success to counteract the only halfway successful recipe. I like the bundt pan design too and I agree whole heartedly with Master Chow’s assessment. I’ve got bananas in the freezer just pleading to be made into this bundt cake. 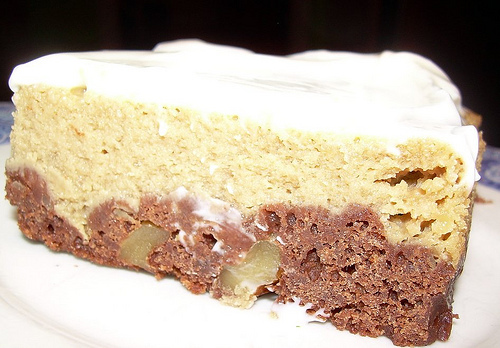 Both your cake and your brownies look errific! I left the sour cream off, I liked the swirls too much! Yours look great! I had to do the sour cream to cover my swirls :-), I like the addition of nuts. 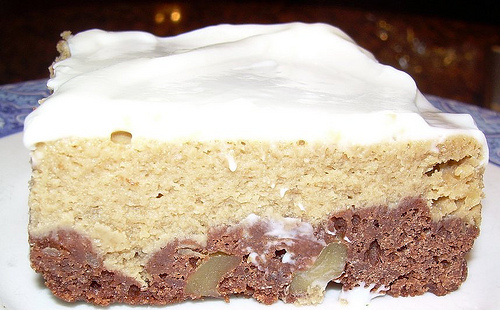 I love nuts in my brownies too – yours look delicious. I am with your husband on the bundt cake – it is beautiful! Nuts are a must in brownies for me! Your photos are divine! And your banana bundt–love it! That banana bread is gorgeous, I love the pan. This is a must try. I have not seen it around before. I am in a brownie baking mood, these days, trying to find the best brownie. Last night, I made a flourless one (Nigella) and it was richer than any brownie, I have had. I also made Tyler Florence’s Rocky Road brownie and I had all kinds of problems, not Tyler’s fault. I use kosher marshmallows and they are made differently than the usual marshmallows. 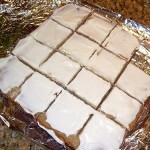 They keep their shape after being baked or broiled and don’t smooth out into a frosting. Ick. I have to print this one and add it to my list for this taste test. Nigella wins over Tyler, right now. The lucky recipients of the brownies are are my fifth graders (school). Thanks for this recipe. Thanks to Dorie also, a top notch baker.